Rexroth technology can be found almost anywhere: Our transmissions ensure efficient energy transfer in wind energy plants. When constructing dams or roads, the highest buildings or longest tunnels, cranes, diggers and other construction vehicles are powered by Rexroth mobile hydraulics. 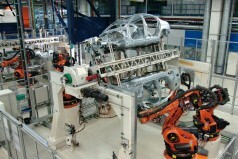 For decades, Rexroth has been supplying the drive and control solutions for steel works, for assembly lines in the automotive industry and semiconductor manufacturing as well as for confectionery production. Bosch Rexroth is the perfect partner for mechanical and plant engineering and supplies automation components as well asinnovative solutions such as the Rexroth 4EE system. In short, Bosch Rexroth is one of the leading specialists in the field of drive and control technologies. We represent a one-stop source for controls, electric drives, hydraulics, mechanics and pneumatics. We develop tailored automation solutions for our customers, with a permanent focus on maximum productivity and responsible use of the world's natural resources. Customers quickly find the right contact at Bosch Rexroth, since it is structured according to market segments and industries. Our global application experience focuses on the business units Mobile Applications, Industrial Applications and Renewable Energies. Be it digging construction trenches, drilling tunnels through solid rock or practicing sustainable forest management — mobile machines provide invaluable assistance by reducing the number of dangerous and laborious tasks. When developing such machines, manufacturers must constantly adapt to ever-changing conditions, such as the significant reduction in permissible emissions in accordance with TIER 4 Final emission standards. Rexroth shares such challenges with its customers. With new concepts for working and driving hydraulics, we ensure that mobile machines meet these standards while maintaining the familiar level of performance as a minimum. Just one example of this is networking the engine control with digital hydraulic controls. As a result, the hydraulics never requests more engine power than is actually required. This greatly reduces fuel consumption while increasing productivity. Because of the vast experience that we have gained from across the globe, we know that each application carries its own particular requirements. Our industry management pools this experience and works together with customers to develop customized solutions. Find out more about Drive & Control for construction machinery, materials handling, agricultural and forestry equipment as well as equipment for road vehicles. 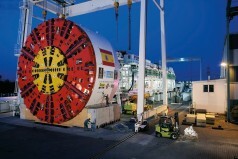 Bosch Rexroth has established itself as a global specialist for plant construction and unique projects, ranging from high-power forming of metal or plastic to laying of submarine cables and calming the movements of cruise ships on stormy seas. Based in over 80 countries, your contacts at Bosch Rexroth are industry specialists with direct access to the company's expertise in all aspects of drive and control technologies. Bosch Rexroth also regularly undertakes large-scale projects as a project partner or general contractor, acting as a system supplier for the new locks on the Panama Canal or for state-of-the-art stage technology for the reconstructed Bolshoi Theatre in Moscow. Bosch Rexroth specialists supervise these projects from their initial conception to final implementation, providing all the services and resources of a global partner. Our renowned project management ensures that our partners reach their technical objectives on time and within the specified budget. Processing gearwheels for mechanical clocks with 1000th mm accuracy or retooling packaging systems for new products several times a day — such procedures are based on complex tasks, which require a careful eye for holistic solutions. Experts in the field of factory automation at Bosch Rexroth have made this skill their own. 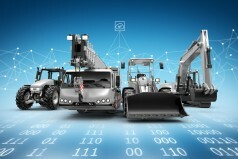 Rexroth combines the benefits of hydraulics, electric drives and controls, mechanics and pneumatics to create energy-efficient and highly productive system solutions. As part of this approach, more and more functions are being transferred to software-based processes, thus advancing the engineering of new concepts. Consequently, our solutions allow machine manufacturers to achieve their goals faster than ever before and thus stay one step ahead of the competition — thanks to enhanced energy efficiency, standardized machine safety and greater flexibility in production. Find out more Drive & Control for machine tools and automotive applications, assembly and handling, semiconductors, packaging and processing as well as for printing and processing. Since the 1980s, Rexroth has been developing ever more powerful and reliable transmission and drive solutions for the wind energy sector. As a partner to system manufacturers, Rexroth has helped to achieve an almost 50-fold increase in the capacity of wind energy plants. The costs per kilowatt hour produced have been lowered to the point that wind energy plays a key role in today's environmental protection efforts. Rexroth has greatly contributed to the global success of this renewable energy source. Furthermore, with innovative services such as condition-based maintenance via the Internet, Rexroth continues to raise the availability of wind energy plants. Ocean energy now harbors enormous potential for the production of renewable energy in the same way that wind energy did three decades ago. In initial prototypes, Rexroth solutions are already converting currents, tides and waves into electricity. 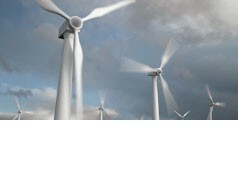 While the technology is still is in its infancy, Rexroth has the conviction and foresight to invest in sustainable solutions for the responsible use of natural resources over many decades — just as it did with wind energy. Find out more about Drive & Control for wind and ocean energy plants.